I am loving the yellow clutch and that awesome red necklace! Fun colors for sure! You're looking radiant in that maxi!!! 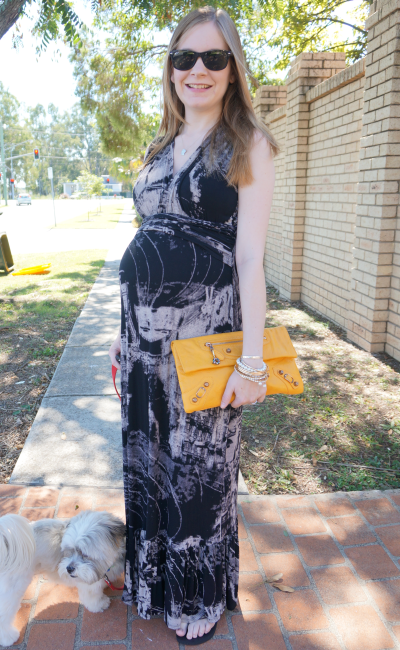 Love that maternity maxi! Such a fun print. As usual, your purse is the perfection. Great pop of color and combo! That maxi dress is gorgeous with the baby bump and the yellow is so perfect with it. I just adore your handbag collection so I will need to check out your listing. Oh yes I certainly indulged! Some for me, some for baby....haha! Yep, I'm trying to pare my wardrobe down as much as possible. Not having much luck though, I still own too much stuff I think! Such a shame you don't get an Easter break! :( Hope you had some chocolate at least! Wow! Talk about best dressed bump. And I am totally crushing on your arm candy - those bags are amazing. I love the dark marbled print! You keep killing me with your killer bags! Obsessed with your bags! I love Balenciaga. You look great by the way! You are looking cuter each week that your pregnancy progresses. Loving the maxi dress and you know I have complimented you on that B+W Skirt before. Love the bags too and how they bring some pop of bright color to each look. Take it easy sweetie. Just a couple more months left. Hi! Meeting you through Pleated Poppy. Love the outfit, and of course both bags! I have the Vieux Rose and just love it. I also love seeing another puppy in the pic! Yes, I'm very glad I wasn't in my third trimester over the height of summer, would have been much too warm! I love the contrast between the yellow and navy. Hope you had a happy Easter! 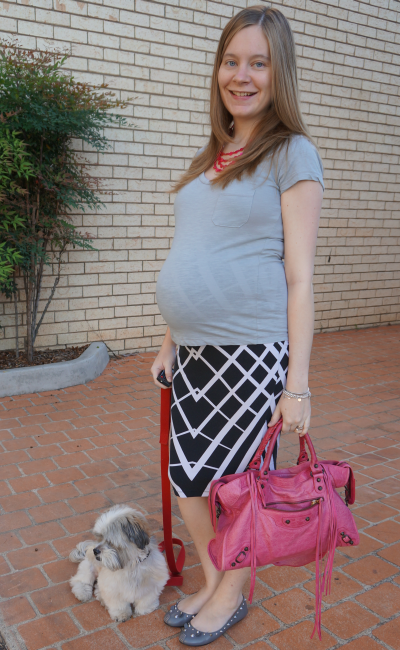 That patterned skirt looks so great, and your bump is adorable! Cute outfits! Love the yellow clutch and pink bag! Congrats! 31 weeks, not long to go! OMG THAT PINK BAG! I want to own a Balenciaga bag some day for sure! Just found your blog in the link up! I'm so glad you are allowed to wear business casual at work! You look great... Happy last few days before baby!! Oh I love your adorable baby bump!!! So beautiful! Can't wait to start following along!